Hunter Size Chart Note: Select your US size. Please be advised, the product and box will display UK, US and Euro sizing. For US sizing, both men's and women's sizing is displayed. Men's sizing is represented by "M" and women's sizing is represented by "F". 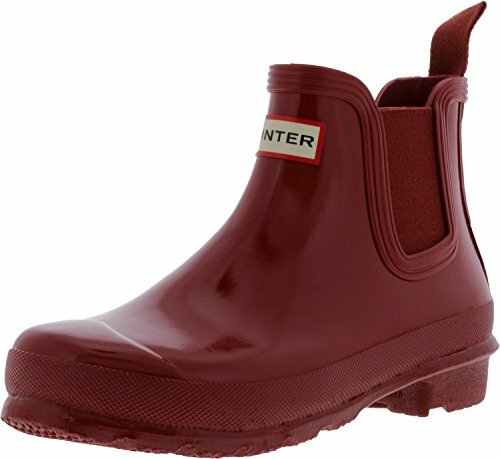 Complete your cold-weather essentials list with the Original Chelsea Gloss One Tab boot. Waterproof rubber upper. Pull-on construction with goring panels. Back pull-tab for easy entry. Round toe. Textile lining. Cushioned footbed. Textured rubber sole. Imported. Measurements: Heel Height: 3⁄4 in Weight: 1 lb 6 oz Circumference: 9 1⁄2 in Shaft: 5 in Product measurements were taken using size 9, width M. Please note that measurements may vary by size. Weight of footwear is based on a single item, not a pair. Pull-on construction with goring panels. Back pull-tab for easy entry. Round toe. Textile lining. Cushioned footbed. Textured rubber sole. Imported. Measurements: Heel Height: 3⁄4 in Weight: 1 lb 6 oz Circumference: 9 1⁄2 in Shaft: 5 in Product measurements were taken using size 9, width M. Please note that measurements may vary by size. Weight of footwear is based on a single item, not a pair.